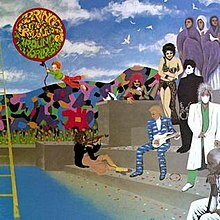 Around the World in a Day is the seventh studio album by American recording artist Prince, and the third to feature his backing band The Revolution. It was released on April 22, 1985 by Paisley Park Records and Warner Bros. Records. Departing somewhat from the commercial sound of his previous release, the massively successful Purple Rain (1984), the album instead saw Prince experimenting with psychedelic styles and more opulent textures. In compliance with Prince's wishes, the record company released the album with minimal publicity, withholding accompanying singles until almost a month after the album's release. Around the World in a Day was released to notably mixed reception after the success of Purple Rain, though it nonetheless sold relatively well, eventually going double platinum and becoming Prince and the Revolution's second number-one album on the Billboard 200. Two of its four singles reached the top 10: "Raspberry Beret" and "Pop Life". Recording for Around the World in a Day was begun in sessions dating back before that of Purple Rain. Following six months of touring behind that bestselling album, Prince returned to recording. An initial inspiration for the album's sound came in the form of a demo, recorded by David Coleman, the brother of Revolution band member Lisa Coleman, which would ultimately become the title track. "The influence wasn't the Beatles. They were great for what they did, but I don't know how that would hang today. The cover art came about because I thought people were tired of looking at me. Who wants another picture of him? I would only want so many pictures of my woman, then I would want the real thing. What would be a little more happening than just another picture would be if there was some way I could materialize in people's cribs when they play the record. I don't mind [the album being called psychedelic], because that was the only period in recent history that delivered songs and colors. Led Zeppelin, for example, would make you feel differently on each song." Despite the low-key promotion and the material on the album being overall not as radio-friendly as Purple Rain, it still had two American top 10 hits, and went double platinum, selling seven million copies worldwide. It was met with mixed critical reception. According to Prince, George Clinton was a fan of the album. In a positive retrospective review, Pitchfork described the album as "a brave and deeply personal project, exploring sounds and ideas that were almost shocking coming from a pop icon at his peak." All tracks written by Prince except where indicated. Prince – lead vocals, guitars, assorted instruments, all instruments on "Condition of the Heart" and "Tamborine"
Brown Mark – bass guitar and background vocals on "Around the World in a Day", "Paisley Park", "Raspberry Beret", "America", "Pop Life" and "The Ladder"
Wendy Melvoin – guitars and background vocals on "Around the World in a Day", "Paisley Park", "Raspberry Beret", "America", "Pop Life" and "The Ladder"
Lisa Coleman – keyboards and background vocals on "Around the World in a Day", "Paisley Park", "Raspberry Beret", "America", "Pop Life" and "The Ladder"
Dr. Fink – keyboards on "Around the World in a Day", "Paisley Park", "Raspberry Beret", "America", "Pop Life" and "The Ladder"
Bobby Z. – drums and percussion on "Around the World in a Day", "Paisley Park", "Raspberry Beret", "America", "Pop Life" and "The Ladder"
David Coleman – cello, oud, fingercymbals, darbuka and background vocals on "Around the World in a Day", cello on "Raspberry Beret" and "The Ladder"
Jonathan Melvoin – tambourine and background vocals on "Around the World in a Day", "Pop Life"
Susannah Melvoin – background vocals on "Around the World in a Day", "Raspberry Beret" and "The Ladder"
Novi Novog – violin on "Paisley Park" and "Raspberry Beret"
Brad Marsh – tambourine on "America"
Sheila E. – drums on "Pop Life"
Eddie M. – saxophone on "The Ladder" and "Temptation"
Suzie Katayama – cello on "Raspberry Beret" and "The Ladder"
Sid Page – violin on "The Ladder"
Denyse Buffum – viola on "The Ladder"
Laury Woods – viola on "The Ladder"
Tim Barr – stand-up bass on "The Ladder"
Annette Atkinson – stand-up bass on "The Ladder"
"She's Always in My Hair"
^ a b Matos, Michaelangelo (2004). "Prince". In Brackett, Nathan; Hoard, Christian (eds.). The New Rolling Stone Album Guide (4th ed.). New York: Simon & Schuster. pp. 654–57. ISBN 0-7432-0169-8. ^ Price, Simon. "Prince: Every Album Rated—and Ranked". The Guardian. Retrieved April 27, 2016. ^ Aretha, David (2012). Awesome African-American Rock and Soul Musicians. Enslow Publishers. ^ "Prince Biography". Rock and Roll Hall of Fame. Retrieved June 16, 2016. ^ a b Palmer, Robert (April 22, 1985). "Records: Prince's 'Around the World'". The New York Times. ISSN 0362-4331. OCLC 1645522. Retrieved September 14, 2011. ^ Hasted, Nick. "Prince: In appreciation of a virtuoso, enduring genius". The Independent. Retrieved December 8, 2016. ^ a b Freeman, Kim (May 4, 1985). "Radio Is Mixed On Prince Album". Billboard. New York. 97 (18): 1, 72. ^ a b c d e f Light, Alan (April 29, 2016). "Prince / The Revolution: Around the World in a Day". Pitchfork. Retrieved April 30, 2016. ^ a b Karlen, Neal (September 12, 1985). "Prince Talks: The Silence Is Broken". Rolling Stone. ^ Erlewine, Stephen Thomas. "Around the World in a Day – Prince and the Revolution / Prince". AllMusic. Retrieved October 7, 2017. ^ Harris, Keith (June – July 2001). "Prince — Every Original CD Reviewed: Around the World in a Day". Blender. New York (1). Archived from the original on August 20, 2004. Retrieved April 8, 2017. ^ Browne, David (September 21, 1990). "Purple Products". Entertainment Weekly. New York (32). Retrieved January 1, 2010. ^ "Prince/Prince & The Revolution - Around the World in a Day CD Album". cduniverse.com. Retrieved September 14, 2011. ^ Weisbard, Eric; Marks, Craig, eds. (1995). "Prince". Spin Alternative Record Guide. New York: Vintage Books. ISBN 0-679-75574-8. ^ Christgau, Robert (July 30, 1985). "Christgau's Consumer Guide". The Village Voice. New York. Retrieved October 28, 2012. ^ "Prince & The Revolution - Around the World in a Day". Austrian Album Charts (in German). Hung Medien. ^ "Top Albums/CDs - Volume 42, No. 15, June 22 1985". ^ a b "Prince & The Revolution - Around the World in a Day". dutchcharts.nl. Hung Medien. ^ "Prince & The Revolution - Around the World in a Day". charts.org.nz. Hung Medien. ^ "Prince & The Revolution - Around the World in a Day". norwegiancharts.com. Hung Medien. ^ "Prince & The Revolution - Around the World in a Day". swedishcharts.com. Hung Medien. ^ "Prince & The Revolution - Around the World in a Day". hitparade.ch. Hung Medien. ^ "UK Albums Chart - April 28, 1985". UK Albums Chart. Official Charts Company. ^ "Billboard 200 - June 1, 1985". Billboard. ^ "Billboard Top R&B/Hip-Hop Albums - June 15, 1985". Billboard. ^ "Lescharts.com – Prince & the Revolution – Around the World in a Day". Hung Medien. Retrieved May 16, 2016. ^ "British album certifications – Prince – Around the World in a Day". British Phonographic Industry. Select albums in the Format field. Select Gold in the Certification field. Type Around the World in a Day in the "Search BPI Awards" field and then press Enter. ^ "American album certifications – Prince – Around the World in a Day". Recording Industry Association of America. If necessary, click Advanced, then click Format, then select Album, then click SEARCH. This page was last edited on 15 February 2019, at 17:53 (UTC).